On the Q4 earnings call, Jim Reid-Anderson said both California parks will also be solar powered and it will save each park one million dollars per year. Yeah. I noticed that. does anyone know when their system will be online? Before, after or at the same time as Great Adventures? Im confused as why Six Flags keep saying that Great Adventure will get a worlds first or be a worlds first when another park in the chain is getting the same thing. like worlds first ABC Tourbillion. Like Fiesta Texas is getting one too for 2018. And the worlds first solar powered park. Two other parks along with Great Adventure are doing the same thing. They never said they were getting the first Tourbillion. They said they were getting the world's first ride themed to Cyborg. They probably hope to have GA's solar array up and producing before the other two parks. The devil is, as usual, in the details and semantics. Over Texas is also claiming their Harley Quinn tourbillion will be a first for North America. Clearly they don't mean the theme since Over Texas already has a Harley Quinn themed ride! At the very least, it's disingenuous to label them both "America's First" even if the "first" part refers to two different things. That only legitimately works out if Over Texas opens the first Tourbillion, and then Great Adventure opens the first Cyborg-themed ride. Technically correct, but misleading. In Great Adventure's news release, they called it "the first of its kind in North America," followed by saying "this futuristic, hi-tech ride will be unlike anything our guests have ever seen or experienced before." That's a little ambiguous but I'd call it misleading if all they mean is the theme. As for the solar projects, I'm assuming Great Adventure is at least farther ahead with the process compared to the other parks. Despite being bigger than both California projects combined, ours could still open first. In addition, based on news articles, it sounds like Great Adventure's will "fully" power the park, while the two California projects only partially power the parks, hence Great Adventure still retaining the titles for both the first and only Solar Powered Theme Park. Yeah, going back and reading their hype and puffery, they're super-non-specific in which is first and whatnot but I do sit corrected. I'd stand, but it's Friday and its hard to type standing. As for the solar power ... I'm still trying to figure out if the people who think the park will close if it's cloudy or rainy are for real. LOL I didn't know that was a question. 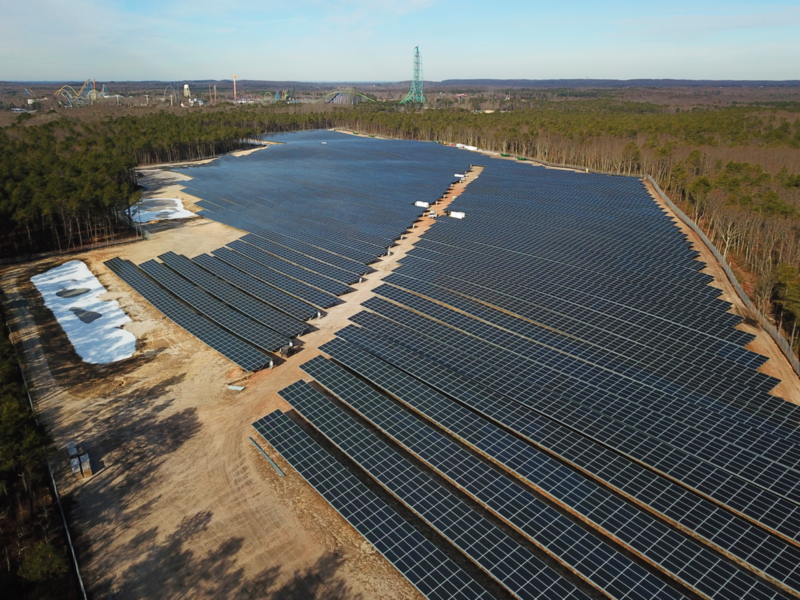 BEDMINSTER, N.J., Sept. 20, 2018 /PRNewswire/ -- KDC Solar LLC, a leading developer, owner and operator of solar power facilities announced today that it has begun construction on a 23.5-megawatt solar photovoltaic system in Jackson, New Jersey. This system will supply Six Flags Great Adventure with clean renewable energy and virtually all its electrical load at the park. 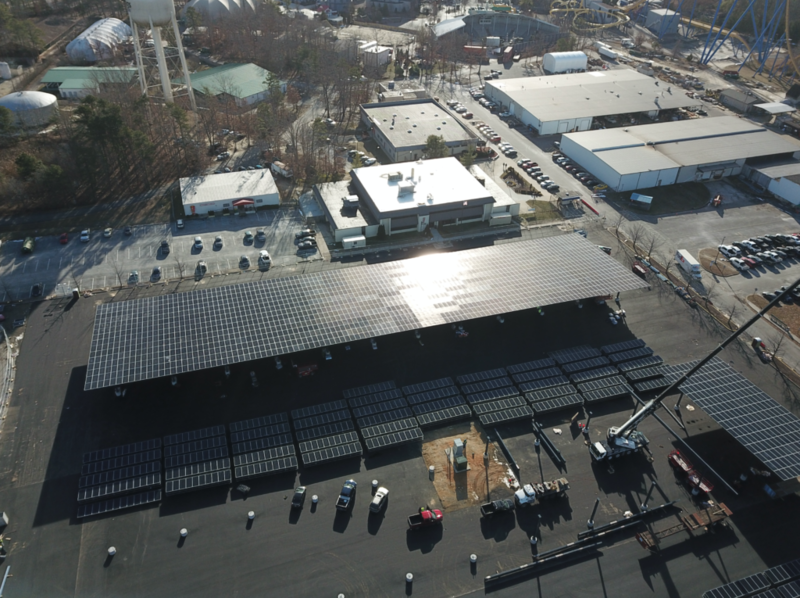 When completed, the project will be the largest net metered solar installation in the State of New Jersey. The solar facility will produce approximately 30 million kilowatt hours of clean electricity in the first year. Additionally, the environmental benefits of the project will be equivalent to providing power for 2,787 homes for a year or removing approximately 108,000 cars from the road. Alan Epstein, President and CEO of KDC Solar said "we are very pleased and proud to have been selected by Six Flags Great Adventure for this groundbreaking solar project. We also want to recognize and thank our partners, GoldenSet Capital Partners and Seminole Financial Services, for providing the necessary capital to build this project." Debt financing for the project was provided by Seminole Financial Services through a construction and a permanent loan facility. Development capital and project equity was arranged by GoldenSet Capital Partners in its role as sub-advisor to the North Sky Capital Alliance Fund II. As a company built on a relationship-first philosophy, we're grateful for the opportunity to work alongside such highly respected organizations as KDC Solar and GoldenSet Capital," said Bob Banks, CEO of Seminole Financial Services. "We're honored to have provided the financing for this monumental project." "The KDC team has an extensive history of successfully developing significant energy projects and represents an ideal partner for GoldenSet Capital and Alliance Fund II" said Everett Smith, Managing Partner of GoldenSet Capital. "We look forward to the continued expansion of our portfolio with KDC" added Rob Pryor, Principal, GoldenSet Capital. The employee lot is also being repaved and installed with the solar panels. They also dug up a line from the overflow lot, down the main entrance road, straight into the Safari entrance. They did a really bad job repaving it. It is strange to see the new telephone poles/power lines on the roadway between the booths and the turn into the lot. Is it just me, or is the picture not actually appearing? It's a Facebook pic so it may depend on permissions. I have seen the ones in the employee lot next to the Admin building firsthand and the solar panel structures are huge. Much larger than I expected or saw at other installations. Happy to see they went through with it! Are we the only park in the chain with a solar array now? Glad the park did something that will work for them as well as the environment. Magic Mountain and Discovery Kingdom will also be getting panels. Thanks Harry, happy to be back active again! Interesting, I was hoping this would be a company initiative! Great way to generate some additional revenue too if there is an excess of power generated that they can sell back to the power company.